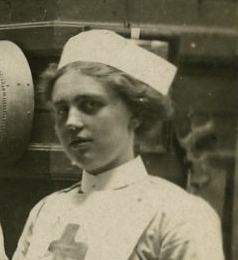 Hilda is a Red Cross nurse from the Voluntary Aid Detachment working at Cleeve Hill hospital. Born and raised in Frenchay, she was a pupil teacher at Frenchay National School, teaching the younger pupils for part of the day and receiving training from the headmaster after school. When the Cave family made their large house available for a convalescent hospital she did some basic nursing training and then went to work as a VAD. At first she was employed winding bandages and cutting cloth for slings. Recently she has started working on the wards. She helps change dressings, feeding the patients and performing other tasks. She has rarely travelled more than five miles from home and finds the soldiers’ stories of their experiences very exciting. Hilda’s mother and aunt run the local laundry from their home. Hilda’s father is the local stonemason. He carves the headstones for the local churchyard. He is very busy as his apprentice has recently been called up. Hilda met RFC pilot, Francis Bingham, while he visited a fellow officer convalescing at the hospital. Hilda is totally enamoured by this dashing hero who has told her of his forays over enemy lines in France.